Mead Homes Ltd, a local property developer have made public their intention to seek permission to build on the land adjacent to 38 Mill Hill (on the East side of the B1102), Swaffham Prior to create 10 houses. The land is currently open fields. 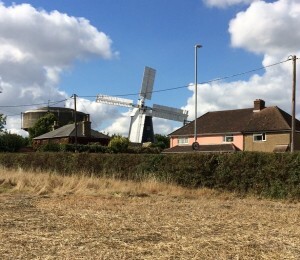 The development, if built, will reduce the availability of wind supply to the mill reducing the number of days the mill can work and negatively impact the setting of this Grade 2* listed building and the Grade 2 listed Smock Tower Windmill on the other side of Mill Hill. The land in question is the only land free of development remaining on Mill Hill and currently provides the best milling conditions when the wind is from an easterly direction. 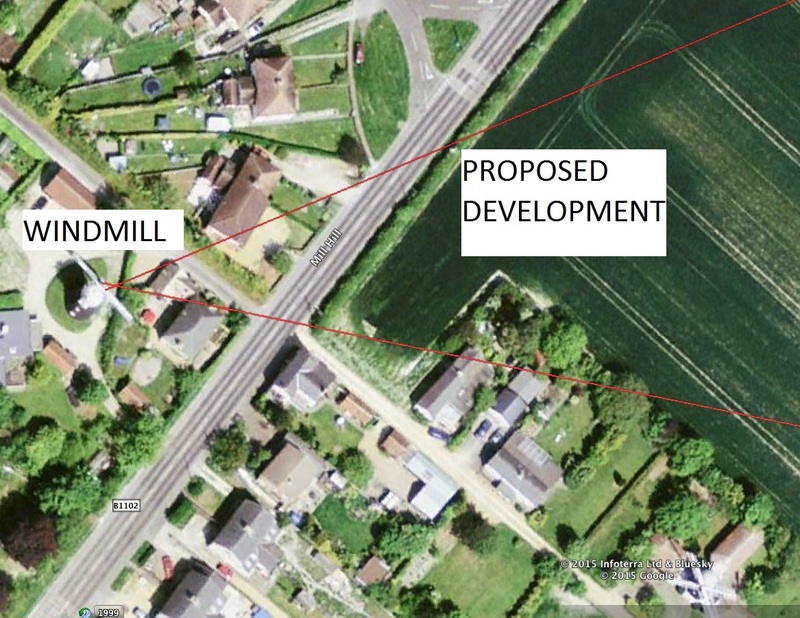 The owners of Fosters Mill are objecting to the proposal, which has come about as part of the East Cambridgeshire District Council’s Local Plan consultation process and follows a similar proposal made by the land owner in the Autumn of 2015. 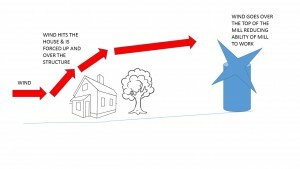 So what’s the problem with the proposed development? 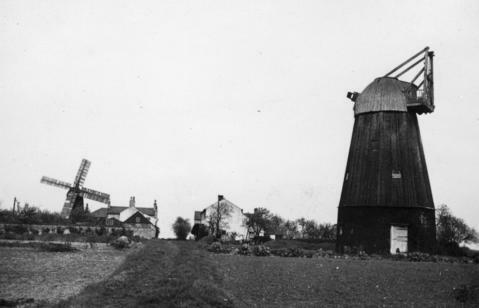 The fundamental problem is that the proposed development, whether comprised of bungalows or houses will reduce the flow of wind to the mill which in turn reduces the days on which the mill can work. The proposed houses will create a barrier to wind flow causing the wind to rise up over the houses and over the windmill (in the process causing wind turbulence) which reduces the power of the wind available to the mill. Trees associated with such a development will further negatively impact wind availability. The proposed development is situated in what is currently open fields to the east of Mill Hill, open fields that facilitate an unrestricted wind supply across Swaffham Heath towards the mill when the wind is from the East North East to the East South East. The topology of the land which gently slopes up to the mill enables the wind to accelerate giving a first rate wind for flour milling. Of all the wind directions, the wind from this quadrant is by far the best for flour milling as it is free of turbulence which is created by buildings and trees. Up until the 1930s, the windmills stood alone on an open hillside free of trees and buildings other than the miller’s houses. Sadly, since 1930 by which time the Smock Mill was not in use and Fosters Mill was in decline, when it was assumed the mill did not have a future, development was permitted on the hill. Firstly, the semi-detached houses on Mill Hill were built, then the Water Tower and then Fairview Grove. All these developments have reduced the flow of wind to the mill resulting in a loss of wind supply. Even the recent development on the Water Tower site has had a further negative impact, something we did not fully anticipate given the already significant impact the large mass of the Water Tower has on blocking the wind from the South West. The proposed development is the first development proposed on green-field land on Mill Hill since the mill was returned to working order. We as present owners of the mill are custodians of the mill for future generations and we take that responsibility very seriously. We want to ensure it has a long term future. This development will reduce the availability of wind to the mill permanently, we will never get it back, something that will result in there being fewer days when we can mill flour using wind power. We cannot allow this to happen as this and any future similar development erodes the potential for the mill to earn its living and thus the building to be protected for the future. Not only will the development reduce the availability of wind, it will impact the setting of the two windmills, impeding views of the mills everyone enjoys as you walk, cycle or drive between Burwell and Swaffham Prior. Swaffham Prior is one of only a handful of villages in the whole of the UK which still has two windmills and the only village where one of those windmills is a commercially working mill. Planners have an obligation to ensure that new development does not negatively impact the setting of listed buildings. Here in Swaffham Prior there is a clear relationship between the two mills as they stand proud on the landscape; building around them in the way that is proposed will significantly reduce their visual impact and the enjoyment people gain from viewing them. In 2013, a Sandtex Survey voted the windmill Britain’s favourite building! Will you stand by and let this development happen? If you believe, as we do, that this development will be detrimental to the operation of our village mill and negatively impact the setting of two listed buildings, please join us in objecting to the proposal for this land to be included as a development site in the Draft Local Plan. To object, you need to make your views known to the Parish Council and the East Cambridgeshire Planning Team. To email the Parish Council, please email Swaffham Prior Parish Council, to email East Cambridgeshire District Council Planning team, email Edward Dade, Strategic Planning Officer. We are not against new housing in Swaffham Prior, but believe housing on this particular land is the wrong place to build given the impact it will have on a nationally important village asset. We will post new information on the campaign here as soon as it is available. Register your interest to receive updates by sending a message to us.